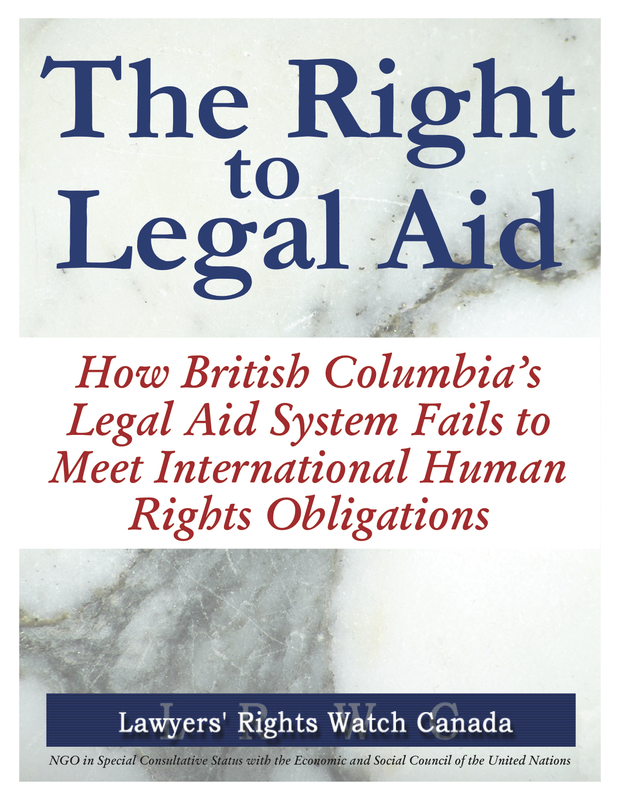 As a result of drastic reductions in funding for legal aid services in British Columbia (BC) over the past fifteen years, the province now fails to meet even the most basic legal aid needs of British Columbians to the point that BC has attracted international criticism from UN human rights bodies. Once a leader within Canada in the provision of comprehensive legal aid programs, BC is now the third lowest province in Canada in per capita legal aid spending. While cuts and service reductions have impacted many people in BC, they have had the greatest impact on women and marginalized people. The impact of inadequate funding, including the elimination of poverty law services and the narrowed scope of family law services, continues to undermine the entire justice system and has far-reaching implications for the health, relationships and social fabric of British Columbians and their economy. This report reviews BC legislation and Canadian jurisprudence on legal aid and measures it against international human rights law binding throughout Canada. The report concludes with recommendations which, if implemented, would ensure that BC is meeting its international obligations to ensure legal aid for those who need it and are entitled to it.